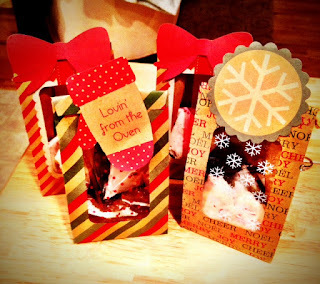 I just adore giving homemade holiday gifts, especially ones that I know will be appreciated. 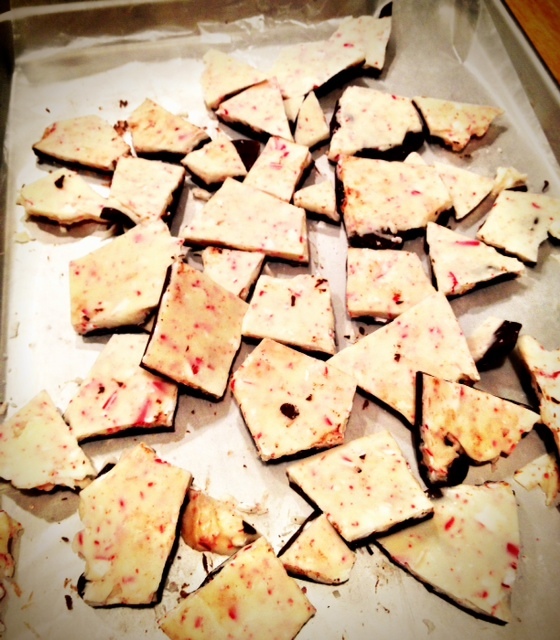 I've never met a person who didn't love Peppermint Bark, and it's SO easy to make homemade. Make a big batch now and keep gift bags of it in the fridge in case any unexpected friends or neighbors pop in with a gift. I'm loving these treat bags I found at Target - 3 for a dollar, you can't beat that! Melt white chocolate over a double boiler (if you're not familiar with a double boiler, place the chocolate in a heat proof bowl- some glass is heat proof, but I use a stainless steel bowl just in case- and set it over a pot of boiling water; you only need an inch or two of water as you don't want it to touch the bottom of the bowl). When chocolate is melted and smooth, remove from heat and stir in crushed candy canes and peppermint extract. 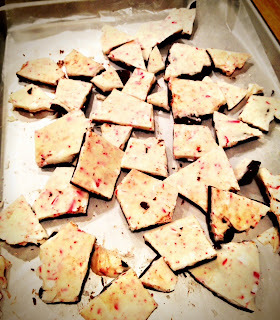 Smooth white chocolate out on a baking sheet lined with wax paper and refrigerate until firm (30-40 minutes). Once the white chocolate is firm, melt the dark chocolate using the double boiler, pour onto the firm white chocolate mixture and return to refrigerator until firm. Break into bite size pieces and serve.